I'm absolutely frustrated with my three-year-old! A distraught mom contacted me about her young child, and boy could I relate! 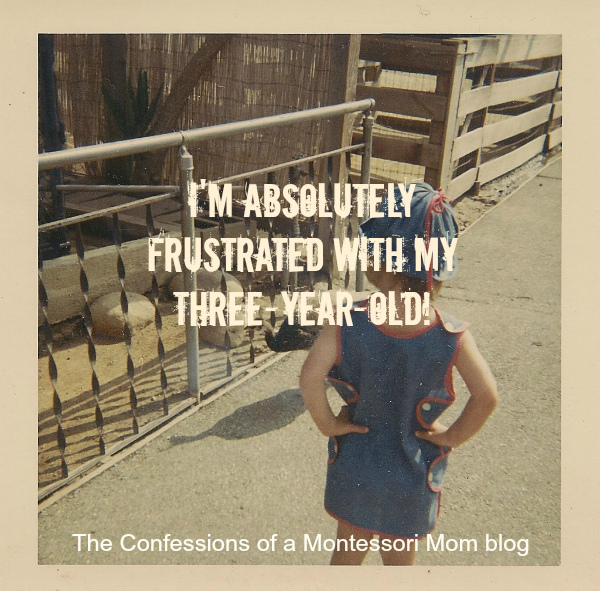 Here is what she said: "I'm absolutely frustrated with my three-year-old. I feel like he doesn't want to learn (as in watch how I do it). When I ask him to watch, he doesn't pay attention and is rushing to get his turn, then when it's his turn he doesn't do it right at all. Another example is putting on socks. After several attempts, he totally fell apart with frustration, and with me trying to help. I didn't want to do it for him because we teach, we don't do for them. I ended up taking my 20-month-old out of the room while leaving him sitting on the stool with his socks and tears and yelling. What are your suggestions?" 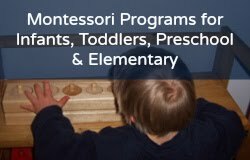 It is very common for moms to have difficulty in giving their young child a Montessori lesson. There's not much you can do about that. You have to wait until they mature a little more to start giving Montessori lessons. I had this same problem with my own son, he absolutely would not and could not take lessons from me. I had to teach him through reading certain books as well as use lots of language at meal time (colors, numbers, letters, names of things). So you can still teach your child, just not directly. And let me just add: this is very, very common with young children in a Montessori home. The second idea for younger children is to allow them to take any activity off the shelf, but they can't do the activity until they have a lesson on it. So what do you do if the child is too young to have a lesson? Show him how to dust the activity. We gave many, many dusting lessons to young children in the classroom who wanted to do certain Montessori materials but were too young. So instead of saying "No!" we said,"Yes! You can dust that." And then we gave a lesson on how to dust the material. Sometimes they dusted it on the shelf (like the Red Rods) and sometimes they took the material to a table or a rug and dusted it (like a polishing work). Socks: let him struggle with it. If he needs help, remind him he can come to you if he needs help. You can also buy him bigger socks so they are easier to put on, or "no show socks." What I learned from my son (and certain students in my class) and the similarities I see in your son, is that they are willing to handle a higher level of frustration than most children. This is the trait of a tiger, for lack of a better word, and it will serve our children in the long run. They will refuse to give up. They will hang in there until the bitter end. They will achieve much more than the average person. They will also, potentially make good leaders who have that inner strength (that same inner strength that drives us moms crazy who have these tiger children). I don't know if this helps you in the short run. Being home with your children all day AND trying to teach them is a big challenge. But if you give up the fight with your child, and instead take materials out of the environment that cause tension and tantrums and difficulty, it is a better solution. It is also wise to replace those items with ones that better suit your child's needs (like different socks that are easier to put on). Having a child with Down syndrome has been a huge challenge for me, my son needed help with EVERYTHING but refused my help nine times out of ten! It was maddening! Now, at the age of eight, I am seeing the benefits of that "inner tiger". (And, yes, eventually he was able to take a lesson, allow me to help him, etc.) He now wants to help me! He has become the child I always wanted, but it was a difficult road to get from there to here!